As many of you know JetBlue’s frequent flyer program, TrueBlue, doesn’t operate like many of the traditional award programs where a flight is a fixed amount of points irregardless of the cash price. Instead with TrueBlue and other programs like Southwest Rapid Rewards and Virgin America Elevate, the amount of points for the flight correlates to the current cash selling price of the flight. Generally, this means a cheaper fare should require fewer points but while looking at some JetBlue flights, this isn’t always the case. Let’s take a look at some strange discrepancies I found. Noitce anything strange? The cheapest cash option should be the Blue fare which it is as that doesn’t include a checked bag so that makes perfect sense. 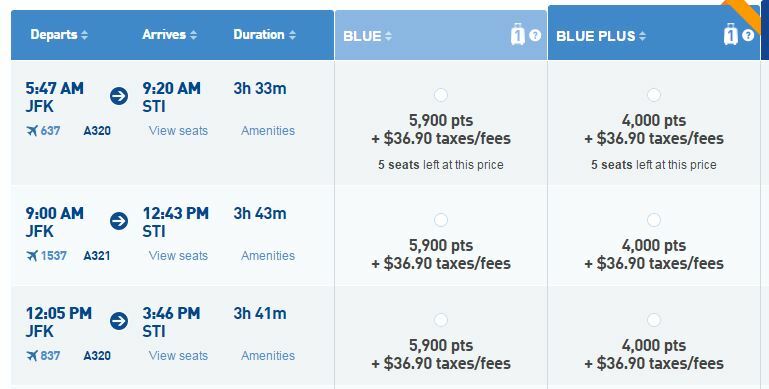 Now take a look at the point options for the same flight – interestingly, the higher fare Blue Plus is the cheapest option on points. Basically JetBlue is offering me a 400 point discount to have the option to check a bag for free. In other words, I would be paying more points for the option to pay to check a bag. That doesn’t make any sense! Here is an even more drastic example on a flight to the Dominican Republic where the difference is 1,900 points. By using points on the Blue Plus fare, this results in a value of 2.9 cents per TrueBlue point which is phenomenal. I’m not entirely sure what is going on but my guess is this relates to an IT issue when JetBlue offers a sale or special promotion on certain routes. Let this post serve as a good reminder to look at all fare options, even if you don’t want/need the option to check the bag. This isn’t too widespread as I didn’t notice this pricing quirk on other flights I searched but this is interesting to be sure.